The Bootstrap framework has classes related to working with HTML forms in your website. By using those classes, you may create forms with default and customized styles quite easily. In this tutorial, I will show you how to create forms with different controls like text boxes, textarea, checkbox, radio, file selection, select dropdown etc. with default and customized styles. 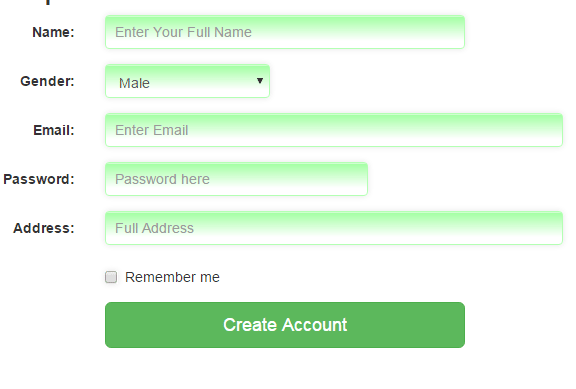 Let me start with a basic form demo by using Bootstrap framework. Following is a basic form that simply uses the Bootstrap default classes. 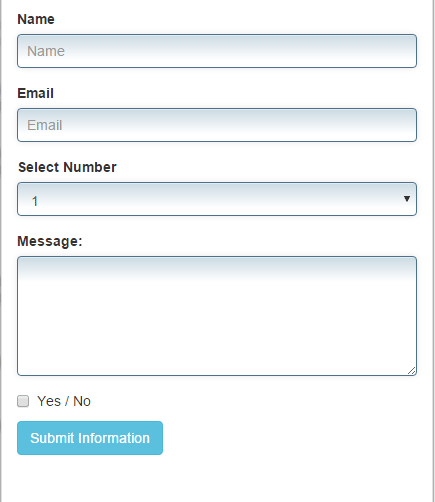 The form includes two textboxes, a select dropdown, a textarea, a checkbox and a submit button. The form is mobile friendly which means form control sizes will adjust with screen. You can see in the code, the textboxes are taking the available space (100%) which is the default. Any input text field with the “form-control” class (a bootstrap built-in class) will take the 100% space. Similarly, the select dropdown and textarea are taking the 100% width as they are using form-control class. The submit button is given the btn btn-info class. You may replace other class names to use some other color for the button. The Bootstrap framework makes it quite easier for us to design HTML forms. 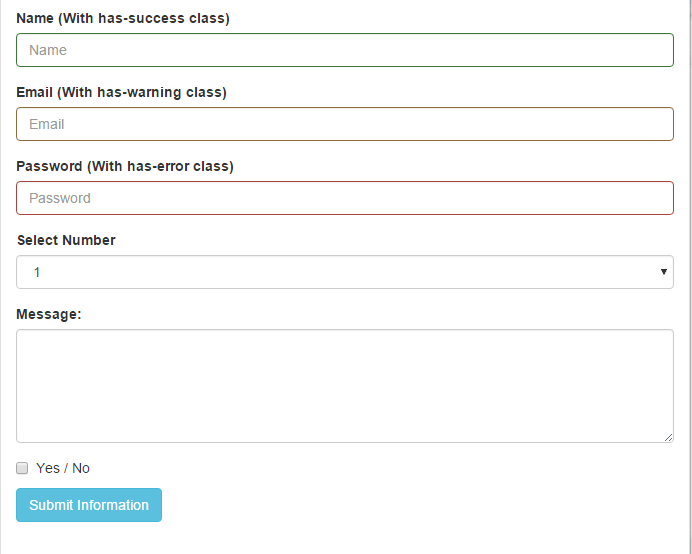 By using a few classes, you may create good looking form fields like shown in an above example. Apart from that, you can mix up custom CSS to change the default look and feel to match the Bootstrap forms to website’s theme. This CSS class is assigned to the text boxes, select dropdown and textarea that added a border, padding, and background to these elements. Also note, the inputstl class is added ahead of the form-control class, which is a Bootstrap default class. So these elements will take those properties as well as custom CSS. Sometimes, you have a smaller area for the form with a fewer fields. For example, a sign-in form or subscription form. You may create inline forms for this kind of scenarios where the form fields and a submit/Signup button appear at the same line and takes much less space. The Bootstrap has built-in class to develop these forms. The class name is form-inline which is used in the following example. Note: This will work for devices with more than 768px wide. If a screen is less than this width the form fields will occupy the full available width just like in the above example. You may get the complete code of both above examples by visiting the demo pages that include references of required files. 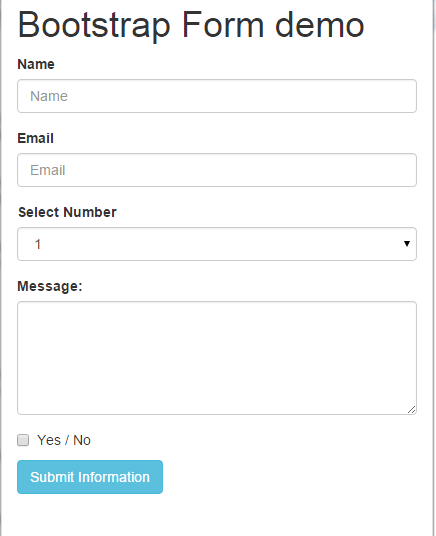 In the following demo, I will show you to create a Bootstrap form with certain validation states in the text fields. The validation states add good user experience, for example, in account creation process you may let the user know if an account id exists or not by using the validation state. Similarly, to create a valid password you may indicate by green lining as long as a password is acceptable by following the guidelines. Same could be applied to enter an email address to validate the email format. Basically, this is the same form as used in the first example except I added a few built-in classes provided by Bootstrap Framework. To add even better user experience, you may include icons in the text fields as shown in the following example. In the following demo, the icons provided by Bootstrap are added at the text fields. Including descriptive icons adds more pro look in the website. Along with using additional classes like has-success, has-warning etc. the textboxes are given the has-feedback class. You may have a look at the complete list of icons here. In the final demo of this tutorial, I will show you how to create different sizes of textboxes by using Bootstrap grid columns. You can see the name field is using the col-sm-4 class in the div. The gender select dropdown is given the col-sm-2 class. Next is an email that uses the col-sm-5 grid class. The password generally requires less space so I used the col-sm-5 for that field. The point is, you may use these classes to control the sizes of the input fields while using the Bootstrap framework to develop forms. The form fields adjust according to the size of the screen. In mobile or smart phones, all controls will get equal in size as this is responsive. In the example, I also used a custom CSS style, which is placed in the head section and its class is added to the above-mentioned fields to change the look and feel of the form. You may style it as per the theme of your website. The custom CSS class is inputstl. Where the btn-lg means it’s a large button, btn-success will define its color and btn-block means the button should take the block like width.